How do Nancy Drew and the Hardy Boys choose what to see at the zoo? Find out in this RPGCast! The RPGCast returns, with a second game based on a Nancy Drew and Hardy Boys Super Mystery! Last time, our heroes had to save the Titanic. This time, our heroes need to save a bunch of pandas! It’s Process of Elimination, and we hope the villains are eliminated first! 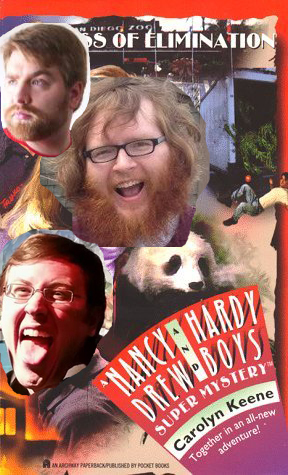 Starring Paul Franzen as Joe Hardy, Michael Ridgaway as Frank Hardy, and Nathaniel Hoover as Nancy Drew. Also starring Michael Gray as the Dungeon Master, who has forgotten the story since he hasn’t read the book in about a year. Nancy has dinner with her friends Bess Marvin and Anthony Green. She is awkwardly forced into learning about the book’s murder victim. Frank and Joe visit the San Diego Zoo. Frank starts insulting Joe’s manhood, because Joe doesn’t want to see the pandas. Frank then immediately runs away at the first sign of danger. Joe jumps onto a moving truck and tries to fight bad guys in the dark. Joe is badly injured, and he is sent to the hospital. Nancy’s attempt to figure out the plot is interrupted by a badly-timed drive-by shooting. Nancy and the Hardys meet at the hospital, and the sexual tension immediately becomes palpable. As usual, the Chief orders the Hardys off the case. Our heroes visit the scene of the murder! They fight bad guys, and Joe gets shot again. Nancy scares off the villains by pretending to make police siren sounds. The tires of both getaway cars are shot, leading to a very low-speed car chase. The Hardys fight over who gets to buy Nancy some In-N-Out Burger. After you’re done, don’t forget to check out the exciting conclusion! I call shenanigans, where was my Mary Sue Move?! Also, I am best Nancy Drew. Don’t even compete with me, Nathaniel. At the end of the Nancy Drew podcast with you, we were running out of time. So I let you do the super-attack on the villain, where you hit him and he went flying across the room. That was what inspired me to add the Mary Sue Move to the game setup. Does this all take place in Southern California? Seriously? I would own this! Poor Joe. Can never seem to make it in life. If it’s not drowining in a swamp it’s getting repeatedly shot. Dude, no, you have to get either lemonade or a milkshake at In-N-Out! Come on! I WANT TO GO HOME NOW AND GET IN-N-OUT. I don’t know which is more impressive, Nancy’s determination to get into the plot, or Frank’s determination to get out of it! Also, I would have been tempted to throw the oncoming truck and its contents into the moon, using my once-per-game ability. I just wanted to say this was great. Hello, everyone! Today, I'm reviewing Millennium: A New Hope.